A Yogi's wisdom is subtle and boundless, Anantam. To avoid misunderstanding and distortion, the higher teachings of a Yogi have traditionally been revealed only to close disciples. Thus, it is a rare gift that Shri Babaji has allowed His direct and deep conversations at the Dehradun Ashram to be transcribed and edited into a unique volume that illuminates the path to Self Realization. The Dehradun Ashram is the sacred background upon which these intimate talks took place. It is the home of Babaji's Tapas, where He meditated in perfect thoughtlessness for twenty hours a day over five years. In search of inspiration and guidance, serious spiritual aspirants began seeking out Babaji at the Ashram after the completion of His Tapas. In this perfectly peaceful atmosphere, their sincere questions can unlock the secrets to spiritual progress and Self Realization. With time comes the accretion of misconceptions and superstition. Like the mythical hamsa (swan) separates milk from water, Babaji answers questions spontaneously from His own experience to dispel superstition and illuminate the Path Supreme. These intimate talks resonate with the spiritual power of One who has Mastered the Knowledge. The wisdom contained in these pages is timeless, yet it addresses the practical concerns and deep yearning of spiritual seekers today. A Self Realized Master is an inexhaustible reservoir of knowledge and inspiration. Having had the fortune to live with Shri Babaji over several years, Babaji's assistant was able to draw from his experience and direct guidance from the Master to collate and edit the transcriptions of Babaji's talks into a sequence of chapters. The book progressively leads the reader from the ‘basics’ (Part 1) as expounded in public programs, to the ‘higher’ teachings (Part 2), ending with a deeply inspirational set of aphorisms, known as the Golden Verses, which were recited spontaneously by Babaji during a retreat. Those who have had the privilege of spending time with Babaji will recognize in it His distinctive style and profound wisdom. As they pour over the pages, they may well begin to visualize the magnificent scene of Babaji sitting on His dais, delivering these sublime truths in the breathtaking atmosphere of the Dehradun Ashram, at the foothills of the Himalayas. 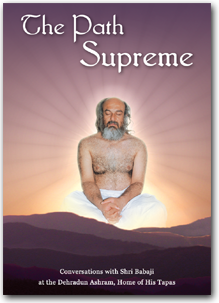 The reader will find themselves being drawn further and further into the Divine Silence which Babaji inhabits, just as spiritual aspirants sitting physically with Him experience in the Ashram. The result is a spiritual jewel that is essential reading for all sincere seekers on the Path to Self Realization - the Path Supreme. Copyright © SRBY 2010. All rights reserved.